Fast track floor coating with one hour set time--eliminates shutdowns. Eliminates coating shutdowns and downtime. 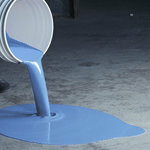 Can be used as a stand alone coating or as a top coat to existing coated floors. The ultimate non-yellowing, corrosion resistant formulation that outperforms most coatings outdoors. Accelaresin™ is approved for shipping to all 50 states by ground or air.